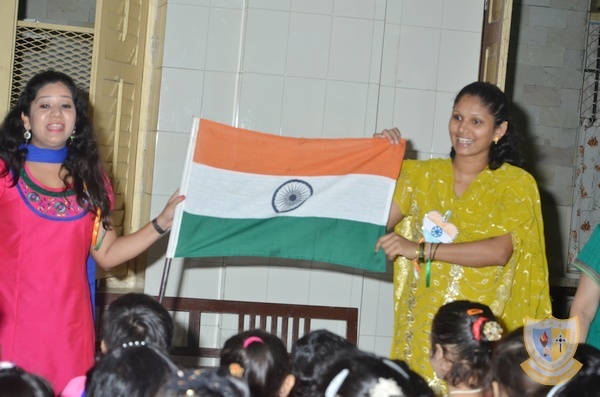 On the 12th of August, 2014 we celebrated Independence Day for the Senior KG of Marian Kindergarten. The children came to school in their traditional dresses. They all looked colourful and bright. We then had a programme in our KG. Hall where we had five children dressed as our freedom fighters and other five as our national flower, national animal and so on. Then we sang a medley of songs for Independence Day. The children proudly wore a heart shape badge or you can also call it a tri-colour badge which was their Independence Day Craft. They got to learn a lot about our leaders and they had fun filled day in school with songs and later a little dance too in their classes. They went home with a chocolate & wearing their tri-colour badge.